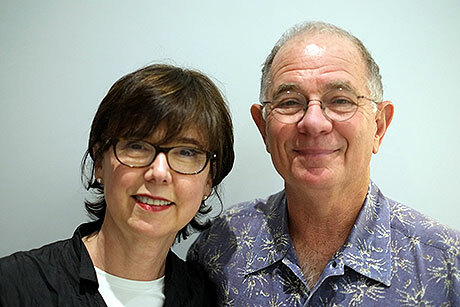 Natives of New Orleans and married for ten years now, each with children and grandchildren, Jan W. Katz and James G. Derbes share an interest in art, architecture, travel, history and a love of the South. Hurricane Katrina kindled their interest in Woodville and this project. In the Spring of 2006, they sought a refuge from future storms. Woodville came to mind – a town to which Jim had been invited years before by the owners of Rosemont Plantation, Percival T. Beacroft and Ernesto Caldeira. The “Hotel” building was available. Woodville was appealing as a quintessential southern town, still possessed of its distinctive 19th Century architecture and home to caring descendants of the settlers who brought it to life nearly 200 years ago. As a town square landmark across from the Beaux Arts courthouse, the building and its situation held special appeal. Jan and Jim each brought to the project the sensibilities and values acquired through their separately-developed, now shared, interests. Jan has worked as a jewelry maker and designer; art collector, dealer and consultant; and museum curator. She opened a gallery of photography in New Orleans, where she was among the first dealers to exhibit the work of the renowned Clarence John Laughlin (“Ghosts Along the Mississippi”) and Michael P. Smith, famous for his images of New Orleans jazz funerals and Jazz Fest. She became known for her curatorial judgment, and for thirteen years consulted in the identification and acquisition of work for New Orleans collections – one for the largest family-owned real estate company in Louisiana. In the mid-1980’s. while married with two young children, she formed a jewelry design and manufacturing business based in her uptown home. Her work won awards and came to be featured in more than five hundred retail stores nationwide. Her creations are still among the favorites worn by the women of New Orleans. Jan was among the first and founding employees of the Ogden Museum of Southern Art in New Orleans. From the museum’s opening in 2003 through her retirement in 2011, she worked as Assistant to the Director, Assistant Director, buyer and product developer for the Museum Shop and Curator of the Center for Southern Craft and Design. The Center, which she created, serves as a platform for the exhibition of the work of Southern artists. Along the way Jan amassed an impressive and diverse collection of contemporary art. Work from that collection is on display in the common areas of Woodville Lofts & Studios. Jim Derbes graduated from Tulane Law School in 1968, and moved to the French Quarter, where his interest in architecture, architectural history and historic preservation began. That interest in and love of New Orleans' 19th Century built environment formed the catalyst for his service as President of the Vieux Carre Property Owners, Residents & Associates, the doyenne of New Orleans preservation organizations; his two-term Presidency of the Louisiana Landmarks Society; and his appointment as Advisor from Louisiana to the National Trust for Historic Preservation. For his distinguished work in historic preservation, Jim received the Harnett T. Kane Award from the Louisiana Landmarks Society. He has travelled throughout Europe and North America. In the early 1970’s Jim became an owner and the publisher of the Vieux Carre Courier weekly newspaper. In 1973, he served as an elected delegate to the Louisiana Constitutional Convention, where he authored the provision retaining constitutional authority for historic preservation. He taught Historic Preservation Law in the Urban Studies Program at the University of New Orleans. While engaged in public service and professionally in the practice of law for more than forty years, Jim’s avocation has been most notably that of renovator, restorer, preserver and adaptive re-user of 19th Century buildings. He has owned and worked on five: an 1830’s Creole cottage in the French Quarter; the 1858 Benachi House & Gardens and two 1880 townhouses in New Orleans’ Esplanade Ridge National Historic District: and most recently, the Woodville Lofts & Studios. For Jim, the defining project was the Orleans Parish Landmark Benachi, a double-galleried, Greek Revival, center-hall plantation style building and its dependencies. This complex consists of about 7200 sq. ft. of floor area, situated on the historic Bayou Road - first an Indian trail and portage from the bayous to the Mississippi river, and now a brick-paved street. The restoration required seven years of work, for which Jim received the 1985 Honor Award for Residential Restoration from the New Orleans Historic District Landmarks Commission. An Italianate double-townhouse on Esplanade Ave. was purchased by Jim in 1991, then restored and re-used adaptively as a bed & breakfast – in conjunction with the Benachi House just across the intersection. That work required two years, at the conclusion of which Jim received another award from the HDLC. That property and another adjoining townhouse were sold in 2012. Woodville Lofts & Studios is by far the most extensive and costly renovation/restoration undertaken by Jim to date. Jan and Jim are thrilled to be able to bring new life and renewed architectural distinction to downtown Woodville.